GE announces a new addition to its comprehensive portfolio of transformer monitoring & diagnostics solutions. The Intellix BMT 330 Bushing Monitoring & Partial Discharge detection system is an on-line system that continuously monitors the condition of transformer bushings and detects developing partial discharge (PD) activity in the transformer main tank on single phase or three phase substation transformers in utility and industrial applications. Bushings account for a large portion of transformer failures, often causing severe and costly damage. With this comprehensive active monitoring system, asset owners and operators are alerted to potential issues before they become critical failures – reducing equipment losses and costs associated with maintenance, asset replacement and system downtime. 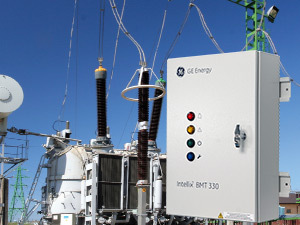 The Intellix BMT 330 can be utilized as a standalone system or as an integrated solution with GE's Kelman™ TRANSFIX Dissolved Gas Analysis (DGA) mutigas analyzer, Multilin 845 Transformer Protection System and Perception™ Fleet Management software to provide comprehensive situational awareness and visualization of the transformer's condition and root cause of transformer failures.